1. In the bad? 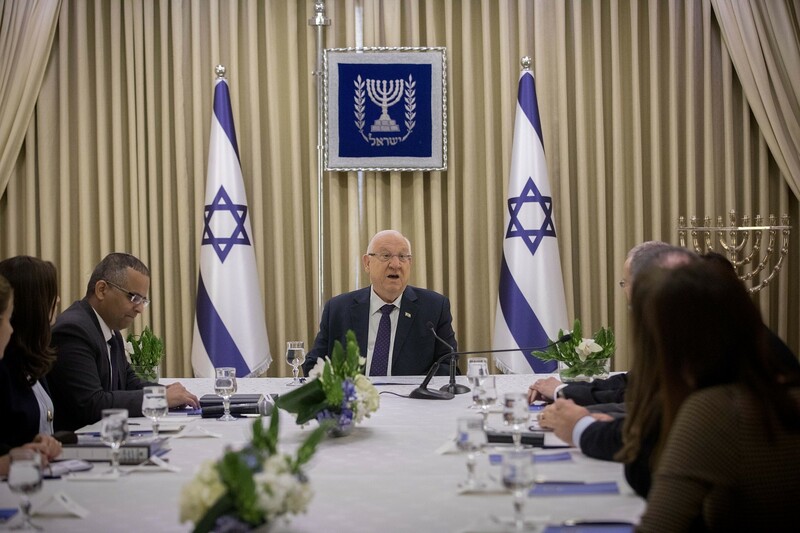 President Reuven Rivlin is beginning the process of consultations with political parties over who he will nominate to form and lead the next government. While in some years, the process is fateful and dramatic, this time around there is little doubt as to who will get the nod: Prime Minister Benjamin Netanyahu. “The coalition has been sealed,” reads a front page headline in Netanyahu-backing Israel Hayom. Netanyahu’s cabinet meeting Sunday had the air of a celebration, with most of those present having won re-election and expecting to be back in their seats. Two noticeable no-shows are Justice Minister Ayelet Shaked and Education Minister Naftali Bennett, who will not be back. 2. Some of the merrymaking may be a bit premature: Yedioth Ahronoth notes that Avigdor Liberman, whose Yisrael Beytenu party Netanyahu needs to form a coalition, hasn’t yet sat down with Likud. While Liberman has said he will not recommend Blue and White leader Benny Gantz as prime minister, he hasn’t said if he will recommend Netanyahu. “We don’t know how he will act,” a Likud source is quoted saying. The main issue is the fact that Liberman’s non-security policy goals are diametrically opposed to those of the ultra-Orthodox, who control 15 seats together and will be looking for a payday. Yated Ne’eman, the house organ of one of the factions that makes up ultra-Orthodox party UTJ, reports that the party has formed a technical bloc with Shas and UTJ to block Liberman. “Liberman and his five mandates won’t put conditions on three parties larger than him,” UTJ MK Moshe Gafni is quoted saying. Channel 12 news reports that Likud fears Liberman may stay in the middle, voting with the government on some issues and abstaining on others, thus allowing the coalition to stay afloat without letting it pass measures like a ban on stores being open on Shabbat. The party denies the option is even under consideration. 3. Liberman, the man for unity: In Haaretz, journalist Raviv Drucker says Liberman has the power to force Netanyahu to sue for a unity government, which is something he is supporting for the first time ever. 4. Big Brother Rivlin-style: Also for the first time ever, Rivlin’s consultations with the parties will be broadcast live, pulling the cover off of one of the most opaque parts of government sausage-making. 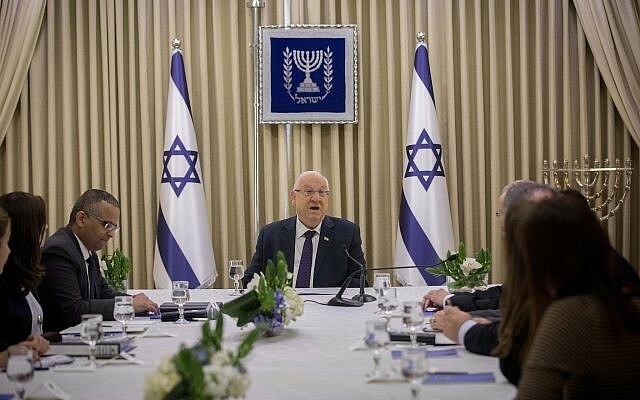 “Rivlin’s unprecedented push for transparency in the process may be nothing but an opportunity to show the public how he reaches that predetermined outcome. After an election campaign that saw Netanyahu himself suggest that Rivlin may try to subvert the will of the people by ‘looking for an excuse’ to task Gantz with the job, the president may be keen to show that the opposite is emphatically true,” ToI’s Raoul Wootliff writes. If you are into that kind of thing, you can follow Raoul on Twitter for his livetweeting of the sausage-fest. President Rivlin opens the consultations over who should be tasked with forming a coalition with Likud MKs @yarivlevin, @regev_miri and @dudiamsalem. He makes a point to say three times that the job is given to "the *Knesset member* with the best chance of forming a coalition"
According to Channel 12 news, Rivlin is taking his job so seriously (or things have gotten so bad with Netanyahu) that at an event for soldiers killed in action he asked to not sit next to the prime minister. 5. No justice (ministry), no peace: Israel Hayom notes that the people who will be sent to Rivlin from Likud will be Tourism Minister Yariv Levin, Culture Minister Miri Regev and MK David Bitan. Channel 13 reports that though the Justice Ministry is being demanded by URWP, Levin, a close Netanyahu ally, will get the nod, leading to fears about the court’s independence as charges against the premier loom. She also notes unlike the last government, Moshe Kahlon won’t go too far out of his way to protect the courts, after noticing how it almost led to his complete political collapse. According to Hoval, Kahlon may have been more willing had more court cases over proposed policies gone his way. The bottom line is that while he’ll continue supporting the rule of law, he’ll no longer “commit suicide” for it the way he did last term, even if he won’t say so openly. 7. Plan-minus: Talk meanwhile is ramping up surrounding the upcoming release of the US-drafted Israeli Palestinian peace plan. According to a report in the Washington Post, the plan will not include a Palestinian state, per se, but something closer to Netanyahu’s state-minus formulation. The Guardian newspaper runs a letter signed by 37 former top European officials urging that the EU reject any plan that does not include statehood. In Haaretz, Abe Silberstein and Daniel J. Solomon say France’s Emmanuel Macron is the last, best hope to scuttle Trump’s plan and a possible drive toward annexation of West Bank settlements, using its seat on the UN Security Council and more. “As a member of the European Union, France could help or hinder the Jewish state’s efforts to pursue tighter economic and political cooperation with the EU. Despite the posturing of some right-wing politicians in Israel, the EU remains Israel’s largest trading partner, and an ally too big to lose,” they write. 8. Shanghaied: Channel 13 reports that the US is also warning security ties may be harmed if Israel doesn’t curb its relationship with China. According to the report by Barak Ravid, also carried by Axios, Trump issued the warning during a White House meeting last week. Netanyahu told Trump that Israel has a committee to deal with it, and could pull back any possible 5G network plans but not the Haifa port contract, which is already underway. “The Trump administration and the Netanyahu government are aligned on virtually every issue, but relations with China have emerged as a main point of contention. The Trump administration has already asked the Israeli government several times to limit its ties with China, and the fact that Trump himself raised it with Netanyahu indicates the White House may be growing impatient,” Ravid writes. On Twitter, he notes that an Israeli security delegation is in Washington for talks with US counterparts on Iran. JTA’s Ron Kampeas compares Netanyahu telling Trump that he’s doing what he can, but it’s partially out of his hands, to the premier passing the buck on a settlements announcement when Joe Biden visited in 2010.